Confession time: I’m a Cheeri0s guy. No, not the cereal, although I’ve been known to start off the day with a bowl of Honey Nut goodness. I’m talking about Modern Cheeri0s, the speediest combo deck in the format. The blistering fast engine combo has been my back-burner deck since 2013 when Paladin was running solo. Then Aether Revolt hit Cardhoarder’s stock, Sram joined Team Equipment, and it’s been my main Magic occupation ever since. That guy who bought Srams at $3.00 apiece as they stocked one at a time? Yep, that was me. That guy throwing around Cheeri0s in Competitive Leagues while you’re trying to play fair Magic with Abzan? Me too. Time for another confession: my Grand Prix Vancouver plans aren’t going to work out, so I need another intrepid combo player to take my place at the year’s first big Modern Grand Prix. I was going to write a series on Modern’s wonderful new deck anyway, and with the double Grand Prix coming up this weekend, I’m dedicating Article #1 in the series to preparing you to drop equipment in my stead. I have a longer Cheeri0s primer in the works but its word count exceeds most Dickens novels and I’m getting lots of requests for some Nexus articles on the deck. Rather than wait to finish my personal War and Peace and Cheeri0s, I’ll be dealing out some of my tips, tricks, and experiences in smaller “Cheeri0s Series” articles. Have no fear! The Cheeri0s primer will be done soon™. In the meantime, you combo fanatics will need to settle for shorter installments on piloting Modern’s fastest deck. I’m opening up the series with a case for why you should play Cheeri0s at the Grand Prix, including deckbuilding basics, statistics from my testing, and tips and tricks to being successful. For those who still don’t know what Cheeri0s is and feel like they’ve stumbled into some strange Magic-themed cereal in-joke, let’s pause and give a quick rundown of the masterpiece in question. Cheeri0s, aka Puresteel Paladin combo or Equipment Storm, is a Modern deck built around Puresteel Paladin and Sram, Senior Edificer. With either engine in play, the deck casts its namesake zero-cost equipment like Accorder’s Shield and Bone Saw to dig through your deck, draw into Retracts, and Retract your equipment with Mox Opals. 19-plus spells later, a lethal Grapeshot seals the deal. The deck is capable of turn-two kills, easily wins on turn three with or without enemy disruption, and is an absolute beauty for anyone who loves combo. Equipment Storm once existed as the fringiest of Tier Kitchen Table decks since 2012, back when MTG Salvation user serenechaos posted his brainchild to the forum. It wasn’t until four years later when Aether Revolt brought Sram, Senior Edificer that the deck grew competitive legs. Although Cheeri0s hasn’t had the breakout success needed for proper Tier 1 or Tier 2 status, its paper and MTGO appearances in the hands of such pilots as Zac Elsik and Caleb Durward are heartening to combo mages everywhere. Check out the current MTG Salvation Cheeri0s primer for more details on how to build and pilot the deck, or just to join a lively community of Equipment Storm aficionados. Like many engine combos, Cheeri0s has a relatively low skill floor but a surprisingly high ceiling. Almost anyone can pick up the deck and quickly Grapeshot off turn-two and turn-three kills. Unfortunately for many Cheeri0s aspirants, it won’t be long before you start losing the Cheeri0s faith as those squishy Paladins eat Lightning Bolts after Thoughtseizes after Fatal Pushes in every single game. Don’t lose hope! The deck rewards tight gameplay, smart mulligans, and effective sideboarding with wins against even the toughest opponents. My goal in “The Cheeri0s Series” is to sharpen your Equipment Storm skills so you can gain these small edges and take down events with this powerful, fast, and shockingly resilient strategy. In today’s article, we’ll be referring to the list I’ve been using on MTGO in the last week. It’s similar to the build used by MTGO user WinRyder to a 5-0 finish in late January, but with small adjustments to reflect my own experiences with the deck. I’m always open to discussing new ways to tune our 75, so feel free to drop me a post in the comments, on Reddit, or on MTGS to talk Cheeri0s shop. +1 Noxious Revival and -1 Grapeshot is a viable swap. I’m heavier on Grapeshot because MTGO is infested with Burn and Affinity, matchups where damage-based sweepers shine and costly Revival tricks don’t. If you think the Grand Prix will have a similar metagame, use Grapeshot. If you think it will be grindier, use Revival. Feel free to drop a Hallowed Fountain for +1 Horizon Canopy in slower metagames. I’m off Canopy because of the aggressive MTGO climate. Canopy also creates awkward scenarios when you have turn one Swan Song or Serum Visions but no blue mana to use them. Last week, Taufik Indrakesuma wrote an excellent article on Cheeri0s through MTG Mint Card where he broke down the main card counts. It’s one of the best pieces I’ve read on the deck since Aether Revolt came out, and I highly recommend it. Most of it will be review for Equipment Storm diehards, but Indrakesuma’s math around Retract and Hurkyl’s Recall is very interesting. In summary, he advocates adding a Recall to greatly increase the deck’s consistency. I tested it over the last week, loved the addition, and immediately dropped 1 Serum Visions (down to 3) to make room. Bonus: it’s a maindeck solution to Chalice of the Void at zero in game one, a big threat with Eldrazi Tron on the rise. Maindeck Swan Song isn’t mandatory but it feels very unfair in many matchups. Against Burn it hits all their removal and Eidolon of the Great Revel. It disrupts BGx removal and discard. It stalls Gx Tron acceleration (Songing a Sylvan Scrying can buy you three-plus turns). Whether stopping unfair decks flat in their tracks or giving you the maindeck out against fair interaction, Song has more than earned its slots in my 60. I change the sideboard multiple times a week on my journey to find the optimal configuration in different metagames. I’m heavy on anti-artifact and -enchantment removal because random Cheeri0s hate is rampant on MTGO: Eidolon of Rhetoric, Stony Silence, Leyline of Sanctity, Rule of Law, Engineered Explosives, and the dreaded Chalice of the Void. In particular, Chalice is everywhere these days. I’m splitting between 3 Truth, 2 Fragmentize to diversify my answers. At one point I was running 4 Leyline of Sanctity to beat BGx strategies and Grixis decks with Liliana. I don’t know if it’s wrong to run those Leylines, but I do know I really want Paradoxical Outcome for the matchup. It’s the only live topdeck against an active Liliana and doesn’t get hit by Inquisitions. Leylines, although lights-out against BGx in most cases, messed with my mulligans and (more importantly) made sideboarding against BGx too difficult. If you are petrified by BGx decks, go -1 each on Outcome, Silence, Truth, and Path, and +4 Leyline. We’ll tackle more deckbuilding considerations in a later “Cheeri0s Series” article. For now, I’m sure most of you are itching to ready your Puresteel Paladins for weekend battle, so let’s jump into the overall Modern picture and why Equipment Storm should be your deck of choice. Based on Jason’s recent January and early February metagame update, Cheeri0s has excellent positioning going into the weekend. 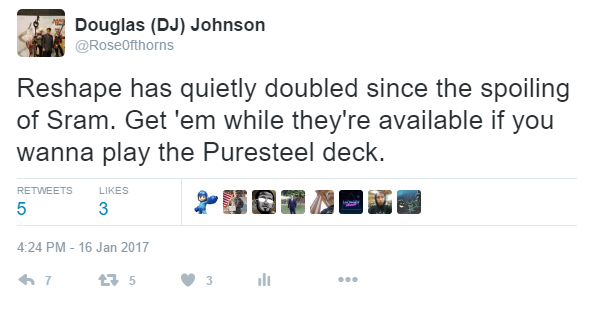 This is not because Puresteel Paladin has particularly strong matchups against a large subset of top decks. It’s also not because Cheeri0s has done particularly well going into the Grand Prix: its dismal Star City Games Regionals performance might actually scare people away from the strategy. Rather, it’s because Cheeri0s is currently the best deck in Modern for getting you free wins in this metagame over the course of a long event. To see why this is the case and why it matters for your deck selection, let’s deconstruct this idea of how Cheeri0s generates free wins, how that plays out in the format, and why that matters at the Grand Prix level. Yes, I’m only one pilot who may not have a representative experience. Yes, n = 300 isn’t strictly speaking a large enough sample to generate a statistically certain distribution. But in my own experience, these numbers signify a truly commanding performance. Cheeri0s wins me 36.7% of total games on turn two or three. 54.1% of my wins are on turn two or three—that’s an absurd number of wins before an opponent can do much of anything. Why does this turn-two or turn-three win rate matter? Because Modern doesn’t have efficient and widely-used answers like Force of Will and Daze. It doesn’t have good cantrips to fix bad openers. This means reactive decks are ill-prepared to find answers period, and are at their worst in the first few turns of the game. And those are the reactive decks that have answers at all! As we’ll see in the next section, many of Modern’s top-tier strategies aren’t actually reactive and don’t maindeck more than four removal spell. Some have zero. All of this means Sram and Paladin are answer-or-die cards that can win as soon as they hit the battlefield, and achieve that immediate win in more than one third of your total games. That’s an edge few other decks can claim. As many old URx Twin players will attest, Twin’s biggest strength wasn’t necessarily a consistent win on turn four or its flexibility in shifting between roles. In many cases, it was the perpetual threat of an end-of-turn Exarch or Pestermite into a followup Twin. Twin could end the game on the spot at any time, which put Twin opponents into a lose-lose tempo scenario. Either you tap out and risk dying to the combo, or you repeatedly hold back cards, sacrifice tempo, and let your opponent generate redundancy or abuse their Bolt reach. Make the wrong call and you just lose with no second chance at an untap step. Post-Sram Cheeri0s is just as punishing as old URx Twin. Every time an opponent taps out against this deck, they risk losing on the spot, a pressure which generates mistakes and free wins from even experienced opponents. This will happen in game one when an opponent doesn’t expect your backup Swan Song and just leaves up Path mana. This will happen in games two and three when an opponent fires a Thoughtseize on the draw and sees two engines and a grip full of equipment—should’ve held up for that Bolt! Or they see zero engines because you have one waiting on top courtesy of Serum Visions. It will also happen in post-board games where opponents mulligan to 6 or 5 to find removal and then get stumped by a turn three upkeep Silence. Finally, it will happen when exhausted opponents decide the coast is clear to make the big play and you punish them with a game loss. In these regards, Cheeri0s shares Twin’s ability to punish opponents for making bad plays and not respecting your ability to untap and win on the spot from a board position of just two lands and no other permanents. The only other deck in Modern capable of this is Grishoalbrand and other Griselbrand variants, and even there, they might have a warning sign in the graveyard courtesy of Faithless Looting. Twin similarities aside, we don’t want to oversell the comparison too much. Remember, Twin could always just win with Exarch and Pestermite beatdown backed by Bolt-Snapcaster Mage-Bolt. Although Puresteel Paladin beatdown is absolutely a viable path to victory (I win approximately 8% of my games with pure Paladin and Sram aggro), it’s nothing like Twin’s legendary Plan B. This means savvy opponents and players loaded with removal (beware of Grixis Control) can still outlast you by holding back disruption and playing the super long game. But players who are tired, haven’t faced Cheeri0s before, or who miss key removal draws can always fall prey to the combo. This is particularly powerful if you topdeck the engine after your opponent thought they were in the clear. 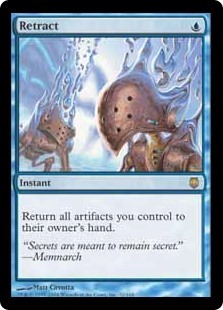 Coupled with the turn-two and -three win element, Cheeri0s’s Twin factor ensures even more free wins against the field. Now let’s see how those free wins play out in the metagame itself. If we extend this to the major Tier 2 players, we’d add Grixis Control/Midrange (2.7%), Grixis Delver (2.4%), and Eldrazi Tron (2.1%) to the first category, and Abzan Company (2.4%), Ad Nauseam (2.4%) and Death’s Shadow (2.9%) to the second. I’m sure you see where I’m going with this. All 15 of these decks, Tier 1 and Tier 2 included, make up about 62% of the format going into the Grand Prix weekend. About 24% of the format is running 5+ interactive spells; these are going to be rougher matchups. Grixis Control, Delver, and BGx Midrange are particularly loathsome. But almost twice as many decks, about 40%, are running 0-4 maindeck disruption spells. These strategies have a roughly 40% chance of drawing one of those answers in their opener, which means 60% of your game one contests against these decks will be virtual goldfishes where Cheeri0s will just get you a T2, T3, or Twin-factor freebie. Decks with zero removal spells should be effective byes. Although an opponent’s chances improve in games two and three with added interaction, so do your odds of beating that interaction with your own sideboard. My MTGO numbers reflect this reality. Looking at the stats, my GWP in game one is about 71%. My GWP in games two-three? 69%. Think about that for a moment: Cheeri0s’s ability to generate free wins and sustain a high win percentage didn’t decay at all after sideboarding. In that respect, Cheeri0s has similarities to Dredge. If you draw the answers, Cheeri0s might lose but can still fight those answers with its own sideboarded bullets. If you don’t draw the answers, or don’t draw enough, Cheeri0s just wins outright. To be clear, Cheeri0s is not favored in interactive matchups. My GWP plummets to just 52.8% against those decks in the first category (Jund, Abzan, Burn, etc. ), and only 25% of those games ended with me winning on turn two or turn three. That’s not great, and it feels worse in real games than it looks in the numbers. Grixis decks are particularly awful, with early Delvers and Tasigurs closing out the game behind a screen of Snapcasters, Pushes, Bolts, and Kolaghan’s Commands. But then there are the less interactive matchups. Against decks in the second category (Tron, Affinity) or third category (Infect, Dredge), my GWP shot up to 78% with 43% of those games ending on turn two or turn three. That’s just as unfair in practice as it sounds here on your screen. More to the point, those decks make up close to twice as much of the Modern metagame as the interactive ones. This means I’m comfortable (and you should be too) sacrificing your interactive GWP for free wins against that larger subset of strategies which won’t be able to answer those turn-two or -three Paladins and Srams in the first place. You’re going to be tired in Round 13 on Day 2. Heck, you’re going to be tired in Round 7 on Day 1! When exhaustion sets in, gameplay deteriorates and even simple interactive lines become challenging. You know what’s less challenging? Going through the routine motions of a combo chain. Those turn two wins are breaths of fresh air where an opponent will either fold on the spot and give your mind a rest, or you can zenfully execute the combo like a martial arts pattern. Many interactive decks don’t have this luxury and every turn can be a real puzzle. Many of your free wins won’t be puzzling and will be mid-tournament breaks. Just as it’s easy to play out a free win when you’re tired, so too will playing out those free wins not tax your mental resources. As only true combo players know, it can be very soothing to just proceed step by step through your combo sequence with only a few decision trees along the way. Also, it’s downright refreshing to draw card after card off each artifact (watch out for drawing too many cards and getting a judge called). While other decks are puzzling through each turn from Round 1 onward, you’ll get free rounds where you can just breeze through a combo sequence and save your mental energy for later. Cheeri0s inspires a lot of anger on MTGO. Cheeri0s inspires a lot of anger period. Although I sincerely hope no one says to you in person the things they type to me on MTGO, the underlying emotions are still likely to be present in a face-to-face match. Every time you get the free win, know that many of your opponents are probably thinking about Tweeting Aaron Forsythe or Sam Stoddard to demand an emergency banning of Paladin, Sram, and Retract all at once. Bonus points if they make those comments out loud. This kind of tilt will cloud judgment, produce play errors, and lead to concessions when you might even have fizzled or loss. Capitalize on this. Grand Prix Day 1s tend to be incredibly open with a diversity of archetypes and decks. Day 2 gets narrower as a cadre of top-notch interactive decks rise to the top followed by a horde of unfair, linear, and non-interactive decks that raced their way to Sunday. In this field, Cheeri0s’s superior speed and consistency will consistently generate free wins against decks that are slightly slower (i.e. almost everyone else) and aren’t packing enough interaction. It’s easy to forget this, but we Nexus readers and online Modern community members are an extremely well-informed and knowledgeable group. We consume more Modern information on a far more regular schedule than the average player. This means many of your opponents, particularly on Day 1, won’t even know what you’re playing. This increases the odds of free wins and catastrophic opponent misplays. It even affects more knowledgeable players! For years, turn-one Seachrome Coast into Serum Visions meant Ad Nauseam. The standard BGx follow-up was Tarmogoyf or Dark Confidant, not holding up Terminate mana. That, of course, is a fatal misplay against the turn-two Paladin or Sram. Between the advantages of free wins themselves, my own GWP and win-turn distribution experience, and the metagame picture going into the Grand Prix, Cheeri0s has excellent positioning for any intrepid combo mages ready to make a Top 8 Grand Prix mark. As much as I love Cheeri0s, I still acknowledge many of the strategy’s fundamental weaknesses. Sometimes you beat yourself with bad mulligans. Sometimes you get smashed by endless interaction or outraced by a fast deck with a timely disruption spell. Sometimes Eldrazi Tron opens on Chalice at zero followed by turn-two Thought-Knot Seer and turn-three Reality Smasher and you wonder why you didn’t sleeve up Eldrazi Temple instead. Sometimes Burn lands turn-two Eidolon of the Great Revel on the play when you’re already at 13 life from a shockland, fetchland, and two Goblin Guide swings. These losses, and many more, are going to happen. Your job is to not complain about them. Don’t beat yourself up about losses and definitely don’t whine about them out loud. They come with the Cheeri0s terrain and are the cost of playing a deck with such a threatening turn-two and turn-three win percentage. So if you sign on to join Paladin’s and Sram’s merry band, you relinquish your rights to complain about variance, bad luck, and bad matchups. You also acknowledge this isn’t the best deck in the format or even necessarily Tier 1. It’s just an extremely punishing and unfair strategy which is currently in a good position to exploit basic metagame and Modern holes. If you know an opponent is holding up removal, lead on Sram so you can get a guaranteed draw from the cast trigger. Never be afraid to combo on turn two even if you don’t think you can draw into a Retract or Opal. If you fizzle after a few cards, you still drew through garbage and/or found another engine or dig spell. Or you got lucky and got a free win. Word to the wise: if you do think you will fizzle but have a second engine, save one equipment in hand to draw two cards on turn three. Even if you think an opponent is holding up removal, it’s often smart to go for the combo. If they don’t, you get the freebie. If they do and were smart enough to keep the removal in the first place, they weren’t going to tap out later anyway. Modify this as needed if you have Song in your hand, or Visions in hand to dig for Song. Against Jund in particular, it is often beneficial to roll out a turn-one Paladin even if it means dumping equipment. The chances of Jund killing it with their Decays, Terminates, or Pushes is lower than the odds they kept an opener with Thoughtseize, Inquisition, or Bolt. During a combo chain, particularly on turn three or later, it is almost always a good idea to cast a second engine to maximize your draw rate. The odds of running out of mana after doing this are much lower than the odds of fizzling off a single engine. Don’t forget to use Paradise Mantle to generate mana from engines that were already in play. The extra mana will matter, particularly if you invested in a second engine during a combo. Use Noxious Revival offensively to stop Snapcaster targets, disrupt Goryo’s Vengeance, slow down Dredge, and jam an Abzan Company combo. Be creative! That said, don’t be too clever with Revival. Its main purposes are to recover engines, get you a second land from fetches, rebuy Retracts during a combo turn, and retrieve discarded Grapeshots. When you are ready to combo out, drop extra Opals beforehand and use their mana to ready a Swan Song or two. Losing to random Mindbreak Traps or Nourishing Shoals feels very bad. Paladin and Sram beatdown is the real deal. Go-go gadget Indomitable Ancient! Use it as a Plan B if Plan A fails. 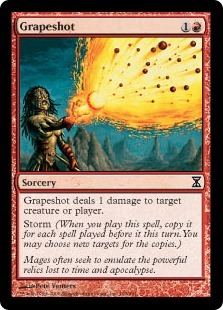 In a pinch, Grapeshot is a removal spell and a sweeper. Cast it to kill Eidolons, Thalia, Guardian of Thraben, and big Tarmogoyfs that have you on a fast clock. When sideboarding, never cut engines, Opals, or Retracts. Don’t go below 18 equipment or you dilute your gas. Generally speaking, your flex slots are the Songs, 1-2 equipment, the 4th Visions or Recall, and 1 of your 3 Revival/Grapeshot slots. This doesn’t mean you need to fill every flex slot; aim to sideboard no more than 5 slots per match. As you can probably tell, I could go on and on with Cheeri0s tips for hours, so I’ll just leave these here for now and save the rest for future articles and the comments. Thanks for reading and here’s to Pureseteel Paladin and Sram, Senior Edificer taking the Grand Prix weekend by storm. I’ll try and answer any and all Cheeri0s questions you have in the comments, so feel free to respond with any thoughts, ideas, queries, or feedback about the deck and the article. See you all around the Modern community! I have gotten a lot of turn one wins and most of my wins are turn 2. What do you think of my version? That list seems super inconsistent to me. 28 equipment is way too many. Honestly, 24 is too many; 20-21 is better. This gives you room for Serum Visions or even Serum Powder if you really want to go the all-in route. For lands, you need at least 14-15 and I strongly encourage you to run Rugged Prairie if you’re using SSG. That way you can at least cast your Paladins off SSG and a single land, which you can’t do with SSG otherwise. I can believe in it! you got a total of 13 sources able to produce white mana, supported by 3 extra mana from ssg. Merfolk uses 12 islands and consistently gets to play lord of the atlantis or brother at turn 2. Those disbelieving the deck may forget that part of your equipment may generate mana as well. (paradise mantle) if some of your equipment is actually also a potential 1/1 germ token for 1 mana. Belcher runs land grant, 8 spirit guides, seething song, dark ritual and expensive builds add lion’s eye diamond. Comparing apples and oranges. You have been one of the longest-time, and definitely the most technical, rigorous, and unbiased architects. This article is incredible and I hope literally everyone takes Cheeri0s to Vancouver. GOGO CHEERI0S! Glad to hear you enjoyed the piece and I can promise at least a few more to come. Agree that mini-eggs was deeply offensive! Here’s to lots of Paladins and Srams at Vancouver! I’m surprised by your assertion on Cheerios’ positioning. I would have expected that a deck that has the hype train on its side as much as this one does that is well positioned would have put up more results than it has. Is this just something coming from a very seasoned and confident pilot of the deck, or is it coming from interpretation of the data? I have a bit of an issue with that, by the way – you lump Death’s Shadow into the “1-4 pieces of removal” category, when the current versions of the deck are packing 8-10 discard spells (including Collective Brutality), 4 Tarfires, 2-3 Kolaghan’s Commands, 2-3 Lilianas, and sometimes even Fatal Push. That deck is chock full of disruption, and deserves to be in the first category. That makes the determination of whether Cheeri0s is well-positioned a bit more complicated. I also have a question on your choice of Bone Saw over Kite Shield. Most folks are on the “maximum toughness pump” equipment plan to maximize the odds of having creatures that are power 2/toughness a bunch (especially in multiples). Thoughts on that? I’m definitely on the hype train from results. It just feels amazing on MTGO, both in interactive and non-interactive games, and the numbers reflect the qualitative experience. I absolutely vouch for it, although you do need some experience with it to see the outs and play lines AFTER T3 when things get more complicated. You’re totally right. I’m going to edit that now. Interestingly, it doesn’t affect my data because I’ve only played a handful of DSZ matchups in my dataset and I’m still 60% against the deck. Paladin and Sram reach is critical, both on the offensive and on the defensive (particularly in double block scenarios). With 12 artifacts that pump toughness, you are very likely to be outside of double Bolt range as-is. The Shields increase those odds and help in a few games, but not as many games as where the Saws are going to help you deter attackers or apply the beats. Hey just a suggestion for the sideboard. Wear/Tear is very strong and I’d be cool with anyone who wanted to do -1 Truth and +1 W/T. I really love W/T against decks running hate critters like Eidolon of Rhetoric alongside Spellskite; an opponent can’t redirect a Tear to Spellskite because it isn’t a legal target.